Growing public & private infrastructure, FDI reforms for construction sector, highway projects and growing economy has led to the overall surge of construction equipment market in India. In comparison with procurement market of construction equipment, rental market in India is at nascent stage but shows higher growth rate. As compared to other developed countries, India's rental market penetration of construction equipment is lower and is limited to Tier-I & II cities. 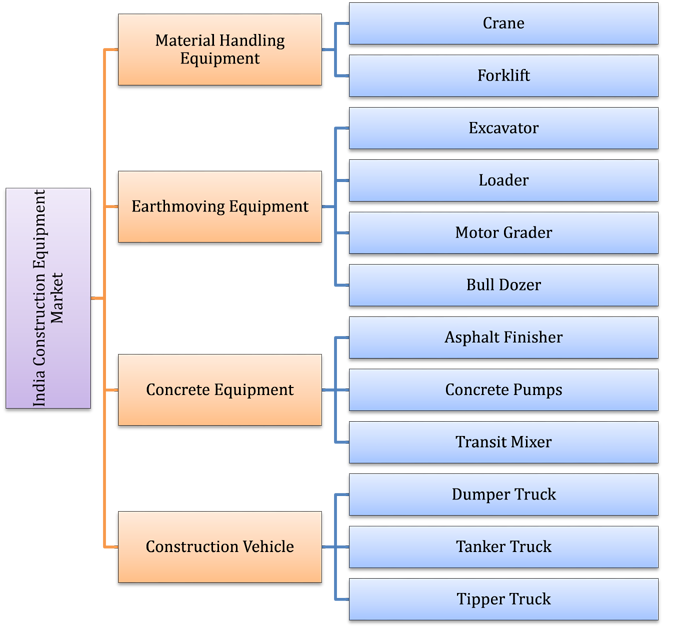 Construction equipment for procurement market is mostly dominated by construction vehicle segment comprising of dumper, tanker and tipper trucks, followed by earthmoving equipment segment such as excavators and loaders. The report thoroughly covers the construction equipment market by types, verticals and regions. The report provides detailed analysis of the on-going trends, market drivers and competitive landscape. • Historical data of Global Construction Equipment Market for the Period 2010-2015. •	Market Size & Forecast of Global Construction Equipment Market until 2022. •	Historical data of India Construction Equipment Market for the Period 2010-2015. •	Market Size & Forecast of India Construction Equipment Market until 2022. •	Historical data of India Material Handling Equipment Market for the Period 2010-2015. •	Market Size & Forecast of India Material Handling Equipment Market until 2022. •	Historical data of India Earthmoving Equipment Market for the Period 2010-2015. •	Market Size & Forecast of India Earthmoving Equipment Market until 2022. •	Historical data of India Concrete Equipment Market for the Period 2010-2015. 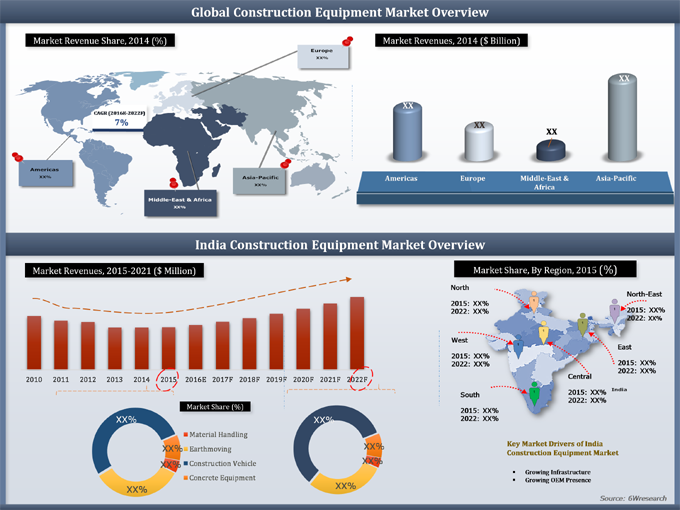 •	Market Size & Forecast of India Concrete Equipment Market until 2022. •	Historical data of India Construction Vehicle Market for the Period 2010-2015. •	Market Size & Forecast of India Construction Vehicle Market until 2022. India construction equipment market is expected to grow on account of increasing number of public infrastructure projects across the country. Further, initiatives by the government to develop 100 new smart cities and setup industrial hubs in the country through “Make in India' campaign would boost the overall construction equipment market in the country. Construction vehicle segment is leading the revenue market share on account of wide deployment in mining and construction sector. Dumper truck held largest share in revenue terms in construction vehicle segment closely followed by tipper trucks. Northern region dominated the overall chunk of revenue share in 2015 followed by southern region and Western region respectively, however, in forecast period, Southern region would grow at faster rate. The report estimates and forecast overall India construction equipment Market by revenue & volume and by Type. The report also gives insights price trends, market trends, company profiles, Competitive landscape, market drivers and restraints.